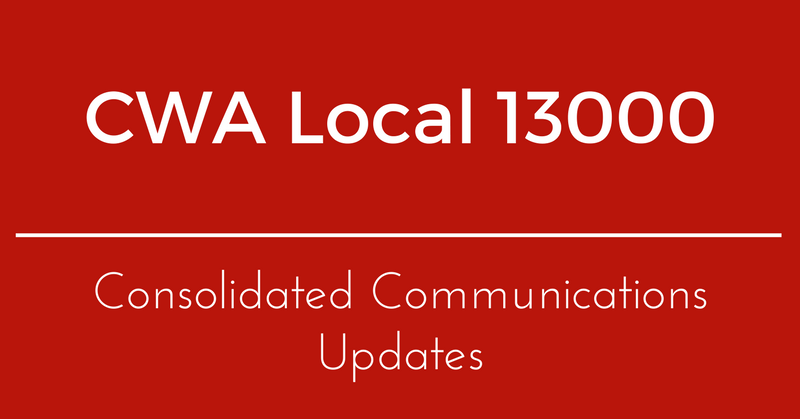 CWA Local 13000 represents two Consolidated Communications, Inc. bargaining units in Western Pennsylvania. A Tentative Agreement was ratified with CCI on by the ILEC members. The new contract will expire on September 30, 2020. CCI CLEC Tentative Agreement has been ratified. The current contract will expire on February 28, 2020. The CWA Local 13000 and CCI bargaining teams met to discuss the CLEC contract on Monday, February 12, 2018. The clock continues to count down to contract expiration and we are still a long way from a fair agreement. The CWA Local 13000 and CCI bargaining teams met to discuss the CLEC contract on Friday, February 9, 2018. Ask your Unit President what you can do to get involved. CWA Local 13000 bargaining continued with CCI over the CLEC contract on Thursday, February 8, 2018. Bargaining between the CWA Local 13000 Bargaining Team and Consolidated Communication, Inc. over the CLEC bargaining unit began on Wednesday, February 7, 2018. The CWA Local 13000 bargaining team reached a Tentative Agreement with Consolidated Communications for the ILEC bargaining unit! Plan to attend the Explanation/Ratification Vote meeting scheduled at 6:30PM on Wednesday, September 27, 2017.